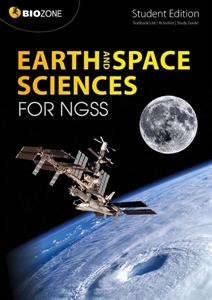 Earth and Space Sciences for NGSS has been specifically written to meet the requirements of the Next Generation Science Standards (NGSS) for High School Earth and Space Sciences (HS-ESS). It encompasses all three dimensions of the standards (science and engineering practices, crosscutting concepts, and disciplinary core ideas), addressing the program content through a wide range of engaging student-focused activities. Through completion of these activities, students build a sound understanding of science and engineering practices, recognize and understand the concepts that link all domains of science, and build the knowledge base required to integrate the three dimensions of the standards to meet the program's performance expectations. The Disciplinary Core Ideas (DCIs) provide the structural framework for the workbook, dividing it into three sections. Each chapter provides activities to specifically address the performance expectations arising from the DCIs. Science and Engineering Practices are supported throughout with activities to develop skills in analyzing and interpreting data, developing and using models, and constructing explanations from evidence. A supporting introductory chapter provides students with additional opportunities to practice the mathematical and inquiry-based skills required at this level. Crosscutting concepts are identified throughout, allowing students to make connections between core ideas in different topics. Download our free classroom guide which assists in the best use of Earth and Space Sciences for NGSS and its features. 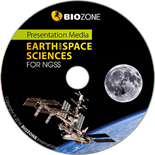 Specifically designed to address the content and aims of the Next Generation Science Standards for HS-ESS. The workbook is structured around the three high school Earth and space sciences DCIs. Crosscutting concepts are easily identified using the tabs at the bottom of the activity pages. Activities designed to meet the science practices requirements at high school level are identified at the beginning of each chapter. A key idea at the top of each page summarizes the primary focus of the activity. A direct questioning style helps students to easily identify what is being asked. Download flyer of our NGSS products here.